How is a cloud made? Taxonomy of a Cloud explores the linear architectural creation of the cloud form – creating a sculptural drawing in the air. 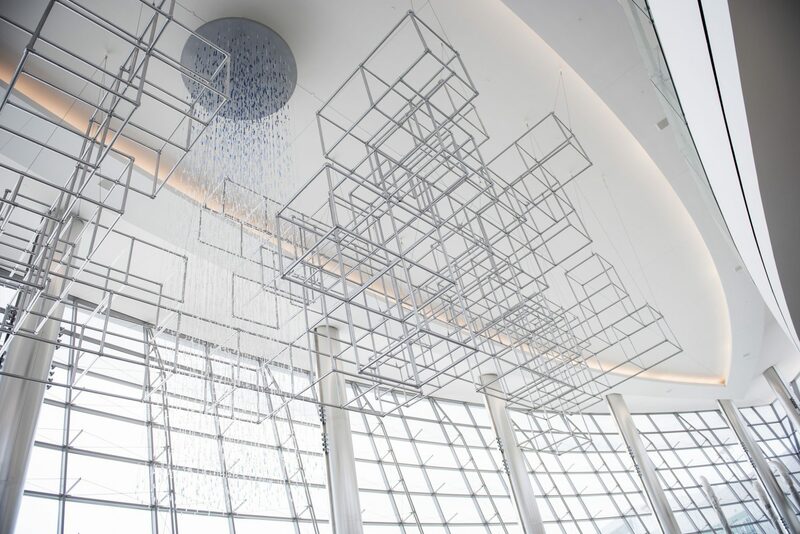 The cloud formation is made of aluminum tubing with a shower of Swarovski Crystals floating above Sunset Cove. The shower of rain is a study on the color of San Diego’s blue sky. The 365 strands of crystals (one for each day of the year) end with a custom element known as “Arctic Crystal” made especially for the Airport Authority by Swarovski Crystal. The entire artwork is 65’ x 45’ wide and 27’ long.